Thomas William Roberts was born in Dorchester, England March 9, 1856. When his father died his mother moved the family to Melbourne Australia. Tom, as he was known attended the East Collingwood School of Design. In 1874 at the age of 18 Roberts enrolled in the Gallery School of Design. In 1881 he raised enough money to travel to England and study at the Royal Academy Antique School. From England he traveled to Spain, Italy and France. In France, he briefly studied with Jean Leon Gerome at the Academie Julian in 1884 in Paris. 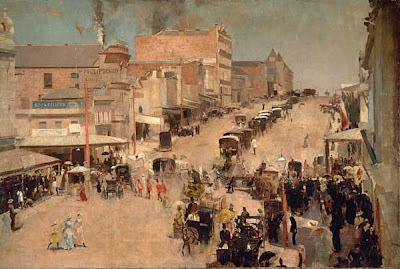 Roberts returned to Melbourne in 1885. 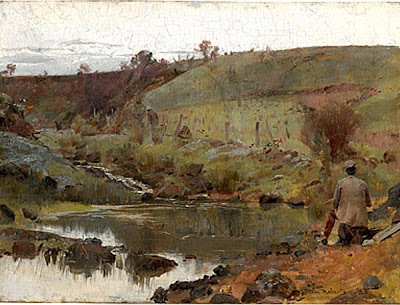 He began spending his summers in the bush, in 186-87 it was at a camp at Mentone with Frederick McCubbin. 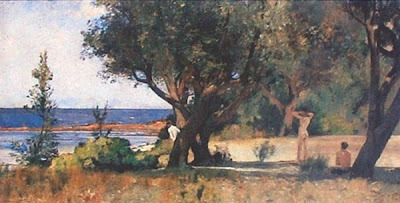 In 1888 Roberts camped with Arthur Streeton and Charles Condor at Eaglemont. These artists became known as the Heidelberg School named after an area outside of Melbourne. He organized the five by nine exhibition with Streeton and others showing their plein air Studies on five by nine cigar box lids. Roberts was the gathering force of the group. These younger artists took Barbizon and Impressionist ideas and went directly to nature for their inspiration breaking with an older generation of painters that worked in the studio mimicking European motifs in Australian scenes. 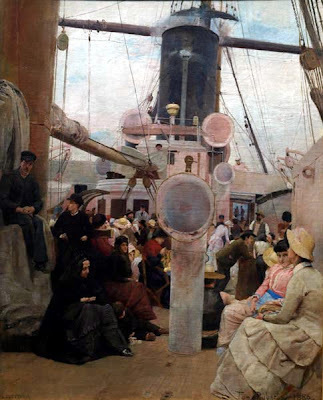 Roberts and Streeton travelled together and painted and camped near Sydney. In 1895 he became the founding member and the first president of the Society of Artists. 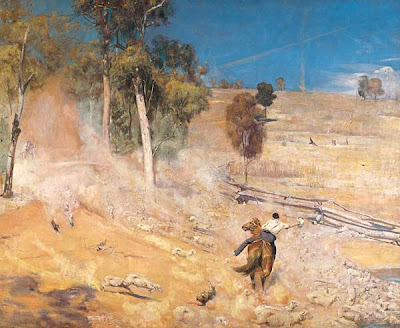 Roberts and Streeton taught together and held exhibitions in Sydney and Melbourne. 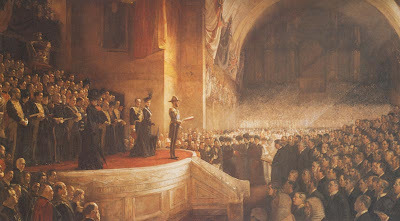 Roberts was commissioned to paint the opening of Australia’s First Federal Parliament in 1901 taking two years to complete the project. The painting is 304.5cm x 509.2 cm (10 x 16 feet). On completion of the painting Roberts entered what he called his black period having trouble with his eyesight and difficulty finding inspiration to paint. He travelled back to Europe visiting Holland, Italy and England. During the First World War he worked as an orderly in a London Hospital. In 1919 Roberts returned to Melbourne and made painting trips to Sydney, Tasmania and New Zealand. Tom Roberts died September 14th 1931. His art would influence generations of Australian painters. 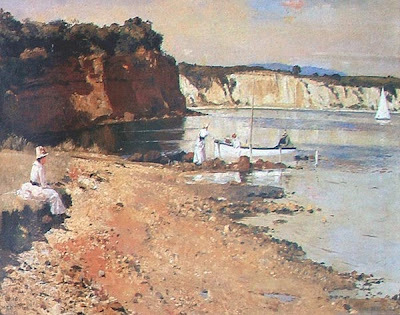 Roberts’s high key impressionist paintings along with the other Heidelberg painters have defined landscape painting in Australia for over 100 years. You might also like to look at Hans Heysen – another iconic Aussie painter. (PS – it's Sydney). Thanks for this great post on an artist that doesn't get enough attention. I love that image just above your Bibliography called "Allegro con brio, Bourke St West." Roberts really absorbed the best of Impressionism without losing strong tones and good drawing. I would have given anything to hang out with him and Streeton and Conder during those golden summers. I think he was a generation later, but I'll check him out. Also, I've gone and corrected my bad spelling; thanks for the heads up. I thought I knew all of Robert's paintings, at least those in public collections or those published in books. But the bottom painting, of a man ? fishing in a pond, is not familiar. Do you know its title and its location? I liked the way he sneaked himself into the painting. I hear Albert Bierstadt did that once in his Hetch-Hetchy Valley piece.